On Thursday afternoon Toyota announced it will invest $50 million in Tesla Motors and will partner with Tesla to manufacture electric vehicles (EVs). Tesla and Toyota announce partnership, May 20th, 2010. Additionally, Tesla announced that it will acquire the NUMMI plant in Fremont, California and begin production of its Model S EV in 2012. This is expected to create more than 1,000 green jobs in California. Tesla expects to produce 20,000 EVs per year. Tesla is a California company, founded in 2003 in Silicon Valley. Their first vehicle, the Tesla Roadster, was the first production automobile to use lithium-ion battery cells and the first production EV with a range greater than 200 miles per charge that could go from 0-60 in under four seconds. Tesla will use the NUMMI plant to begin production of its second generation vehicle, the Model S EV. This 300-mile range, seven-seat SUV will open Tesla Motors to a whole new market of car buyers. 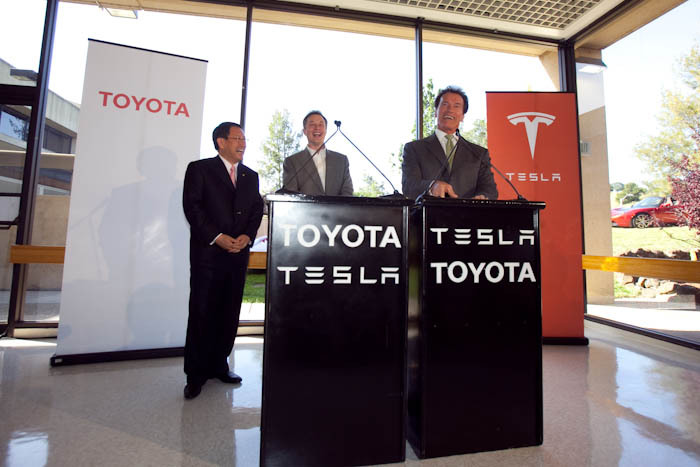 Governor Schwarzenegger announces Tesla-Toyota partnership. 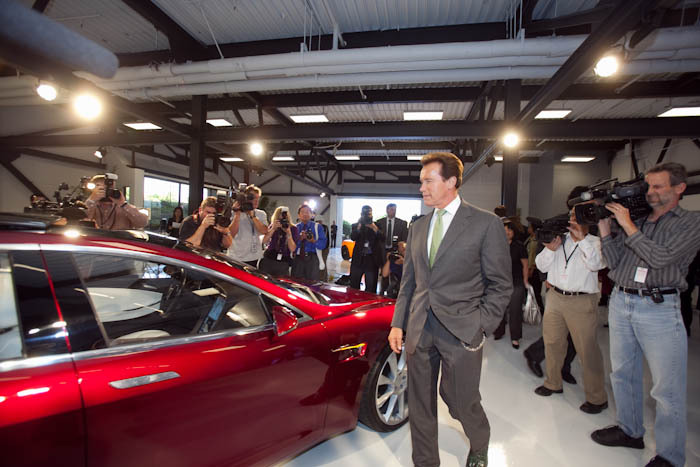 Governor Arnold Schwarzenegger was joined on Thursday afternoon by President and Chief Executive Officer of Toyota Motor Corporation Akio Toyoda, Co-Founder and Chief Executive Officer of Tesla Motors Elon Musk and Lieutenant Governor Abel Maldonado to announce the historic new partnership. The Governor also recently signed legislation, SB 71, to create a sales tax exemption for the purchase of green-tech manufacturing equipment in California. This expanded a sales tax exemption that applied only to Zero Emission Vehicles, which Tesla took advantage of. The expanded exemption, a part of the Governor’s California Jobs Initiative, will not cost the state tax dollars; it will increase revenue by expanding the number of clean technology manufacturing companies with sites in California.